When news that Martin McGuinness had been filmed and interviewed in 1985 for a BBC documentary reached the ears of the British Government, all hell broke loose. Thatcher had already warned that broadcasters must “starve” terrorists of the “oxygen of publicity”. But that warning was routinely ignored by an opportune Paul Hamann, an experienced BBC documentary makeer. He had, by chance, secured an extended ‘at home’ style interview with McGuinness and his wife, as well as with a vitriolic Gregory Campbell. 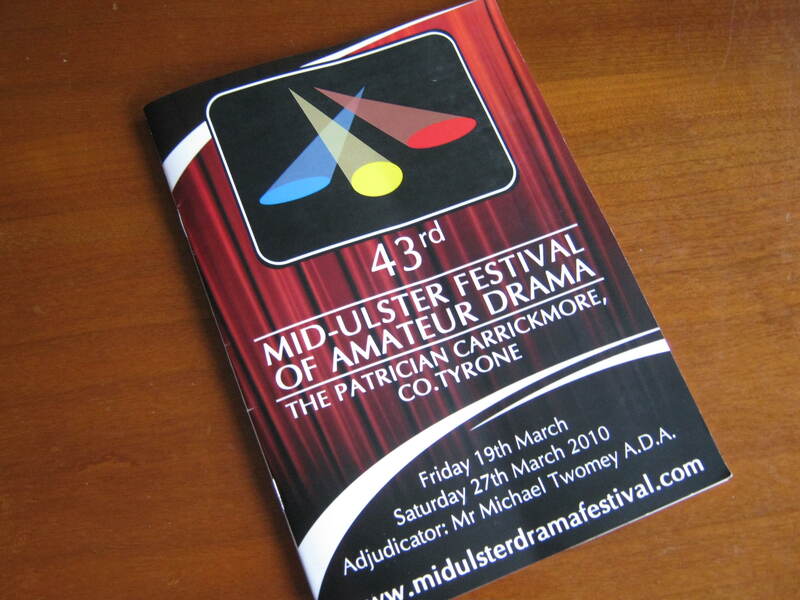 I was full of good intentions about covering the 43rd drama festival every night, but the reality of getting home, making dinner, firing it into me, getting changed and driving up to Carrickmore before 8pm and then not getting home ‘til after 11pm left little time. Martin McGuinness will be the main speaker at the Easter Rising commemoration in Carrickmore this Sunday. After opening sentiments from festival secretary James Warnock and Seamus McNabb of Omagh District Council’s arts and culture sub-committee, the audience settled down for the opening play of the festival on Friday night. The opening moments of a play, never mind the opening play of a festival always suffers from a few moments of discomfort in my opinion, until the players and audience settle into the task at hand. The fact that Shining City opens to such discomfort anyway with a middle-aged man entering the upstairs office of a therapist for the first time only escalates the cathartic uneasiness of the audience. This perhaps made the opening scene difficult with broken sentences and stuttered interaction as patient John, on the cusp of breakdown struggles to explain to inexperienced therapist Ian why he is there. You can only feel that this is the very point McPherson wants to stress throughout the play, broken communication, characters struggle to say what they really mean. The 43rd Mid-Ulster Film Festival got underway in typical fashion last night in the festival’s traditional home, ‘The Patrician’, Carrickmore. Opening night always has the same buzz around it, good crowd, people swamping reception after their tickets and general great atmosphere in the air. The festival got the major boost a few years back in the form of a refurbished Patrician Hall in Carrickmore. While it may struggle to rival some of the features of other new auditoriums around Tyrone, namely Omagh’s Strule Arts Centre, Strabane’s Alley Arts Theatre and Cookstown’s Burnavon, the re-branded ‘Patrician’ offers a substantial improvement for the loyal festival going audience. Neither can the new theatres rival the heritage of Carrickmore’s annual festival. With the media who did descend on Belfast’s Holyland’s for St Patrick’s day leaving seemingly disappointed by early evening, most seemed to have missed the main action late on in Palestine Street. BBC’s coverage of the story is largely confined to the PSNI’s statement today. Focusing on arrest statistics, the story all but manages to slip in at the bottom the official police line. UTV on the other hand went down the ‘morning after’ approach, interviewing Raymond Farley from the Holylands Resident Group who was “outraged” by the police response on Palestine Street to street drinkers.